National pancake day is on Tuesday! 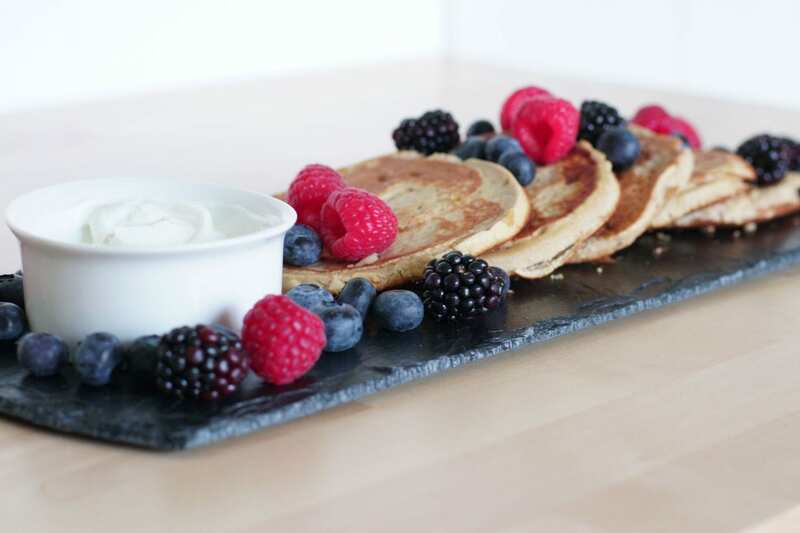 I’ll definitely be making one of my favourite pancakes recipes and serving them with lots of berries and coconut cream. Or with some nut butter, maple syrup, or lemon curd…mmm…while I am making my mind up…Here are the recipes for you to try! Mix liquid ingredients, then stir in coconut flour, baking powder, and salt. Heat a pan or griddle over medium heat. Add a nob of coconut oil and heat. Drop about 2 tablespoons of batter onto the pan. Cook for 3 minutes, then flip and cook for 1-2 minutes. Repeat with remaining batter. These pancakes are a bit trickier to flip. You want to flip slowly unlike you would with a regular pancake. If any batter spills out when you flip, just lay the pancake on top of the loose batter when you flip. Mash the banana with a fork until no more lumps remain. Add in additional ingredients if using. Heat a pan or griddle over medium heat. Add a nob of coconut oil and heat. Drop about 2 tablespoons of batter onto the pan. Cook for 1 minute, until golden brown. Gently flip the pancake slowly and cook for about another minute. Repeat with remaining batter. Chill the coconut cream in in the refrigerator overnight. Do not shake or tip the can – we want the cream to separate. The next day, remove the cream from the fridge without tipping the can and remove the lid. Scrape out the thickened cream and reserve the liquid (you can use it in smoothies). Place the cream into a mixing bowl and beat for 30 seconds with an electric mixer or a minute by hand. You can also try using the blender for 30 seconds, though it is finicky to get all of the cream out of the blender afterwards. Mix in vanilla or honey if desired. Use immediately or store in the fridge for up to 2 weeks. The cream will harden and set in the fridge but can be whipped again. Comment below if you tried one of them.